Buy Now $139.00 SC-605WT 1-20 40,000 gal. 3/4"
SC-605WT Residential, commercial, consistent water flow rates, 3/4 inch unit minimum 3 gpm flow rate required. The 40,000 gallon water volume treated is ideal for small commercial applications, foodservice applications, and residential applications. It is primarily used in residential applications where a replacement cartridge will last approximately 8 to10 months depending on water usage characteristics. The SC-605WT is ideal for any commercial or foodservice application where the water flow rate averages 1-5 gpm and does not exceed 20 gpm. If the average flow rate is below 1 gpm, use the ScaleStick. FA605WT 5-20 40,000 gal. 3/4" 125 psi. FA605WT Residential - Consistent water flow rates of 5 gpm or higher needed. Otherwise percentage of product remains unused. 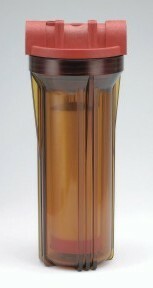 This is a twin system with the pre-filter before the SC-605WT. 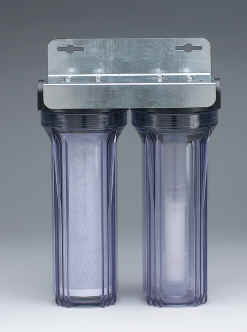 Same applications as the SC-605WT but used where sediment filtration is desired. SC610WT 5-20 80,000 gal. 3/4" 125 psi. SC610WT Residential, commercial use where light sediment removal is needed. Filter element replacement required. The 80,000 gallon water volume treated is ideal for small commercial and food service applications. It is primarily used in applications where the water flow rate averages 3-7 gpm and does not exceed 20 gpm. It is not used much in residential applications since water flow rates rarely exceed 5 gpm. The higher flow rates are required in order to use the entire cartridge. FA610TW 5-20 80,000 gal. 3/4" 125 psi. FA610TWWT Commercial use where light sediment removal is needed. Filter element replacement. 5 gpm minimum flow rate. HBW High Temp Unit. 2-20 65,000 gal. 3/4" 150 psi. SC610EHT High Temp Unit. High Temperature feed water unit. Commercial dishwasher applications where booster heaters are used. The HBW is used in hot water feed applications where the incoming feed water is heated. This unit is used in foodservice applications after the hot water heater and before the booster heater feeding the dishwasher. It is the only unit which is not available in a clear housing. When possible, use a HBW on the hot water heater feed line. This will protect not only the booster heater and dishwasher, but the hot water heater as well, and will allow for visual checks of the product level. The HydroBlend Water Treatment Systems have a wide range of applications depending on many variables. These include: 1) Water Flow Rate, 2) Water Volume Treated, 3) Water Line Size, & 4) Application. Although HydroBlend is very forgiving in its applications, correct sizing must occur, otherwise the possibility of over or under-feeding. The most critical factor in correct sizing is flow rate. This will most likely determine the correct unit to place. If the flow rate is too slow for the unit applied, then over-feeding will occur which will call for more frequent cartridge replacements. Too high a flow rate for a unit may restrict the water flow which is not desired. 1,200 gal/day / 8 hours of operation = 150 gal/hour / 60 minutes = 2.5 gpm. Using either of the 500,000 gallon units would not be a correct application of the product. This would result in high over-feeding. (Refer to the specification sheet for minimum flow rate required) The SC605 would be the correct application in this instance just as long as the peak flow rate did not exceed the 3/4" maximum flow rate (17.5gpm @ 50psi). If it does exceed the maximum flow rate, then the unit should be side streamed parallel to the main line. Most plumbing designs are over sized to allow for peak flow rates or growth. Just because there is a 1 1/2" line does not mean that the unit has to be the SC1.5. The average flow rate will determine the size of the unit. If the water usage characteristic is on/off-on/off-on/off, then determine what the flow rate is during the time that the water is on to correctly size the unit. The type of unit applied is determined by the flow rate and not the desired frequency of cartridge changes. Do not apply the 500,000 gallon units solely because they require less frequent cartridge replacements. Unless the water chemistry is unusual, it should have no effect on the sizing of the unit. Any low average water flow rate should always use a ScaleStick. This usually applies to flow rates of less than 1 gpm (coffee, espresso, ice machines, steam equipment, etc.). Some applications are unique and require special consideration. Ensure that all the variables are taken into account when applying units, especially the flow rates. Prevention of scale buildup on heating elements, walls, and bottoms of hot water heaters is a must. According to the US Bureau of Standards, 114" of scale buildup on heating elements requires 55% more energy to attain the same temperature. This translates into real dollars wasted with an inefficient water heater, not to mention the added expense of repairing and replacing overworked water heaters due to scale buildup. HYDROBLEND will not only prevent scale buildup but also remove existing scale. Typically, dishwashers require chemical flushing to remove scale deposits that form inside the machine. This chemical flushing cannot rid the BOOSTER HEATER of unwanted deposits. Spotting associated with hard water will also be eliminated without the use of expensive water treatment. Food service equipment, especially those generating steam are constantly plagued with scale buildup reducing efficiency and life. Since HYDROBLEND is suitable in applications up to 200' F, hard water no longer threatens equipment. Prevents scale buildup on evaporator plates. Prevents bridging (ice frozen together) which is common in ice bins makes hard clear ice. Reduced energy costs, as bin stays full. Precipitated calcium carbonate forms a tenacious scale on R.O. membranes when softeners are not used prior to the membranes, resulting in loss of ability of water to pass through the membrane, and a subsequent reduction in performance. HYDROBLEND prevents calcium carbonate and silica fouling without the use of added, expensive, water softening equipment. By forming a microfilm coating inside pipes, HYDROBLEND protects plumbing from aggressive water. This prevents lead leaching from solder used to join copper pipes and protects these pipes from forming leaks due to corrosive water. When exposed to air, iron & manganese ions will oxidize and come out of solution leaving unsightly red‑brown stains. HYDROBLEND sequesters these ions keeping them from oxidizing and staining fixtures. Furthermore, it protects water softeners from iron fouling. There are many benefits to using HYDROBLEND in residential applications. It provides 11soft" water by sequestering hard minerals and protects plumbing, appliances, and fixtures from scale buildup. Also prevents iron & manganese staining. Provides corrosion control in aggressive water areas and is a natural post treatment for acid neutralizers. Misting systems used in either agricultural or temperature control applications are susceptible to scale buildup and clogging of the fine misting heads. This also applies to foggers and drip irrigation. This equipment is notorious for having scale problems. HYDROBLEND Will significantly reduce this problem on the tower and clean the scale that has been allowed to build up thereby increasing the life of the cooling tower. HYDROBLEND is a unique composition blended to exhibit superior limescale (calcium carbonate) prevention and corrosion control. It is superior in the treatment of scaling caused by hard water minerals, plus controls staining caused by the precipitation of iron and manganese. HYDROBLEND utilizes the same principals of preventing scale build‑up and corrosion control as polyphosphates. However, this is accomplished without any of the problems which often plague the use of common polyphosphates. HYDROBLEND is utilized as a solid block in cartridge form, exposing a predetermined amount of surface area, from which accurate dissolution rates can be predicted. The system feeds a controlled, consistent amount of HYDROBLEND into the water stream by way of a specially designed media delivery head (MDH), which diverts water into the cartridge sump, dissolving a predetermined amount of HYDROBLEND . This system allows accurate feed rates and predictable treatment volumes unlike standard polyphosphate treatments. The media delivery heads are designed to treat water flows from as low as .1 gpm to as high as 50 gpm. The most important advantage in using HYDROBLEND instead of standard polyphosphates is that unlike polyphosphates, HYDROBLEND is not affected by high temperatures, retaining its full ability to alter the morphology (shape) of scale causing minerals. This provides the greatest amount of scale prevention available. Moreover, HYDROBLEND will remove existing scale once formed in pipes and water fed equipment, plus provide corrosion control in high temperature equipment. When compared to the cost of standard water softening equipment, HYDROBLEND provides effective corrosion control (which softeners aggravate) and scale prevention, at a fraction of the cost and maintenance. Since the HYDROBLEND systems work on water volume, not time, there is no waste with its use. When it has dissolved, you simply replace it. A simple glance at the clear or translucent housing lets one know when replacement is needed. HYDROBLEND systems require no electricity, maintenance, or guess work. 1) It acts as a scale inhibitor by distorting the almost perfect cube shape of calcium carbonate as it precipitates out of solution. By distorting the uniform shape, it will not allow the calcium carbonate to build up (deposit) on itself. It will also over time remove existing scale in the system. 2) It is a sequestrant to iron and manganese in that it prevents these minerals from forming oxides (rust) and precipitating out of solution, thus eliminating the red & black staining caused by iron and manganese. 3) It combines with the calcium carbonate in the water forming a protective film of calcium phosphate on the inside of pipes and water fed equipment which acts as a deterrent to corrosion and scale. This microfilm does not increase in thickness as it is continually washed off and replaced. Water is the universal solvent. It dissolves everything it comes in contact with, whether it is as "hard" as iron or as "soft" as acid in the air (acid rain). Because of this, the water we use is usually saturated with many dissolved minerals. Mineral saturated water is water that has been in contact with minerals for a prolonged period of time, usually under pressure, and has dissolved as much minerals as it can hold in solution. The amount of dissolved minerals depends on the water source (ground, surface, or municipal supply) and the water chemistry such as pH, oxygen content, temperature, along with other factors. Any change made to the water chemistry will affect the water's ability to hold these minerals in solution. When water is heated, its ability to hold calcium carbonate (limescale or hardness) in solution is decreased. This causes limescale deposits in hot water heaters and other water fed equipment. A pressure change, such as water through a faucet or spray head, will cause calcium carbonate to come out of solution and form hard water scale deposits. Water which has been treated in municipal water systems is subject to the same conditions.